It was a tough choice, but my dirty legs won over my Tyrannosaurus Rex-looking arms (apparently my arms don't look normal when I run trails) when it comes to the image I'd prefer to remember in conjunction with today's 10K Spring Runoff. Not that I expected to be clean after running 6.8 miles across Vail's trails, but I never thought my legs would be covered with so much dirt. That was what last week's Mudderella was for--when I still found mud all over my body after splashing into the Hat Trick obstacle's pool and after showering in the Rinse & Revive area. The Runoff's course didn't even seem that muddy, dusty or dirty--plus I'm so slow when it comes to running down the trail that I couldn't have been kicking up that much dirt. But one glance at my lower half at the finish line and I was sorely mistaken. Instead of being sweaty, and caked in the white salty residue I'm accustomed to after most warm-day races, my legs had acquired a shade of brown that no summer tan could ever match. 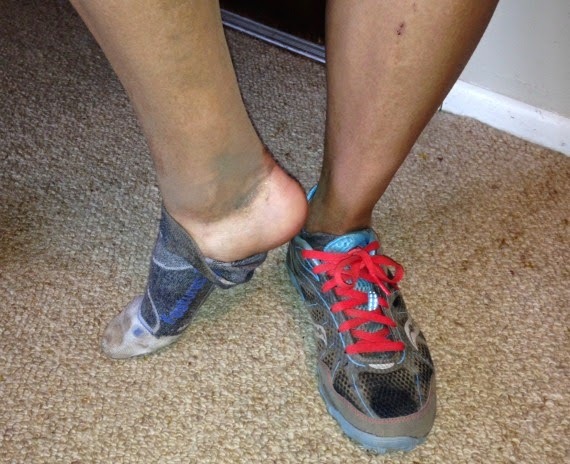 Do your legs look this dirty after you've been running on the trail? As for my T-Rex arms, I'm the poster child for those T-Rex Hates Pushups T-shirts. You'll have to come back to see those because I'm too embarrassed to post them anywhere but a race report.